We’d love your help. 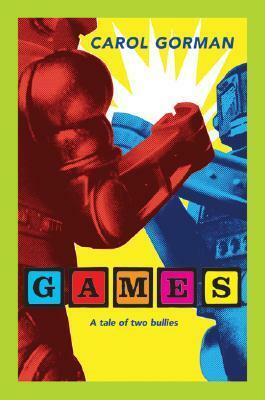 Let us know what’s wrong with this preview of Games by Carol Gorman. Mick Sullivan likes reading thrillers, daydreaming about Tabitha Slater, and teasing his archenemy, Boot Quinn. Boot Quinn likes playing his guitar, daydreaming about Tabitha Slater, and punching his adversary, Mick Sullivan. The two eighth graders are rivals in every way, and with two fights in the first week of school, they've set the stage for a yearlong showdown. That is Mick Sullivan likes reading thrillers, daydreaming about Tabitha Slater, and teasing his archenemy, Boot Quinn. The two eighth graders are rivals in every way, and with two fights in the first week of school, they've set the stage for a yearlong showdown. That is, until a new principal arrives on the scene and forces Mick and Boot to spend an hour and a half each day playing games together. Two enemies, one small room, and no adult supervision—battle lines are bound to be crossed. As the wins and losses are tallied, the boys find themselves fighting for their classmates' attention, a cute girl's affection, and their own fathers' respect. But how far are they willing to go to win? And who are they really fighting? To ask other readers questions about Games, please sign up. This book was fine. I didn't love it, but I didn't hate it either. There were things that I enjoyed, and things that I didn't like too much. 1. The book had a cool cover. I know the cover doesn't and shouldn't reflect my opinion on the book (and it didn't), but it was just something I enjoyed. It really reflected the book well and really expressed the rivalry in the book. 2. The book seemed pretty relatable because of the fighting because everyone (probably) develops a rivalry or This book was fine. I didn't love it, but I didn't hate it either. There were things that I enjoyed, and things that I didn't like too much. 2. The book seemed pretty relatable because of the fighting because everyone (probably) develops a rivalry or some enemy at one point or another so it was good reading about something that I could easily relate to. 1. It was interesting, and I was always on my toes to see how the boys would feel while playing the games. Sometimes it was a negative overall effect and sometimes it was positive. This is why I believe that this was a neutral aspect because some parts I liked and some I did not. 1. The boys didn't have strong personalities, so it was hard to tell who was speaking in the "alternate personalities" and I found myself continually going back to "check my facts" in the book. For these reasons, I gave this book three stars. Overall, pretty good read but not my favorite book. Happy Reading! This review has been hidden because it contains spoilers. To view it, click here. Okay, so Iiked the book but I have a problem with it. Why didn't Boot get a happy ending? I love Mick and I'm very happy he got his happy ending. A new (NICE) girl he likes, he didn't get in trouble for what he did to the library (in all honesty he deserved some punishment for that), his mom and him finally decided to leave his dad who didn't deserve them. I'm very happy with Mick's ending so the problem is why didn't Boot get a similar ending? Instead he gets that girl Tabitha who does NOT deserv Okay, so Iiked the book but I have a problem with it. I love Mick and I'm very happy he got his happy ending. A new (NICE) girl he likes, he didn't get in trouble for what he did to the library (in all honesty he deserved some punishment for that), his mom and him finally decided to leave his dad who didn't deserve them. I'm very happy with Mick's ending so the problem is why didn't Boot get a similar ending? Instead he gets that girl Tabitha who does NOT deserve him, he's still living with his dad and brother who I know will probably treat him good for a week maybe a month if he's lucky before getting back to mistreating him, and it wasn't made clear if he was able to repair his friendship with Jesse and his dad. Why does one have a better ending then the other one? Also... They broke my heart near the end. I was crying. I was so happy to see that although they're not exactly friends (yet) Mick still defended Boots. It's not BAD, it was just... not really my thing. (I also feel it was kinda misbranded? The cover felt like it was gonna be video game-y/superhero-y, and it definitely wasn't. Great book about two boys who can't get along and the struggles they have at school and at home. It is surprising what you can learn about someone while playing a game. Boot and Mick despise each other. After getting suspended a number of times and getting in trouble at school, the new principal comes up with a new solution to try and resolve the issues between the boys. Everyday for over an hour, the two boys must go to the "game room" and play board games while they are there. Crazy idea, right? Well, Mr. Maddox, the principal, thinks it is the perfect solution and he decides to give it a go. During their time in the "game room", the boys continue to battle th Boot and Mick despise each other. After getting suspended a number of times and getting in trouble at school, the new principal comes up with a new solution to try and resolve the issues between the boys. Everyday for over an hour, the two boys must go to the "game room" and play board games while they are there. Crazy idea, right? Well, Mr. Maddox, the principal, thinks it is the perfect solution and he decides to give it a go. During their time in the "game room", the boys continue to battle things out, but this time over some different issues, such as the cute girl with braces, Tabitha. The boys also participate in a dare game, which gets them into some deep trouble, and discover an underground tunnel in the school. While getting to learn about each other in the game room, the boys learn about each others lives and realize that underlying issues at home are what is really causing the issues between the boys and they begin to see through the light and come together to help one another out. I really liked this book. It was so realistic that I felt as if this was something that could have happened while I was in middle school. The issues of bullying, trying to impress girls, and alcoholic and abusive parents are things that continue to occur today and this book did a great job of telling a story involving all of this. The way that the boys worked through their problems and realized that they weren't so different from each other made for a wonderful storyline and it kept me hooked the entire way through. The tale of two bullies, from first met to last stand, the hatred always there. Games by Carol Gorman, is a book about two enemies, Mick Sullivan and Boot Quin. They harbor feelings of hate towards each other. The book takes place mainly at the middle school Mick and Boot attend, however the setting changes throughout the story, bringing the readers to places such as Mick or Boot’s home, recreational areas such as the library or the music shop, or even Mick’s vivid imagination. Within the story, The tale of two bullies, from first met to last stand, the hatred always there. Games by Carol Gorman, is a book about two enemies, Mick Sullivan and Boot Quin. They harbor feelings of hate towards each other. The book takes place mainly at the middle school Mick and Boot attend, however the setting changes throughout the story, bringing the readers to places such as Mick or Boot’s home, recreational areas such as the library or the music shop, or even Mick’s vivid imagination. Within the story, the characters are dealing with many conflicts in their lives at the moment. Mick, for instance, is struggling with his life with a dad who has a drinking problem and his mother on the verge of divorce, while Boot is struggling with the harmful, social, physical, and emotional effects from Mick’s bullying. A struggle both boys have in common is the struggle for a girl at school, Tabitha Slaters, attention. Tabitha usually is the drive for their fights in the story, because both boys want her to think of them, the hero. The Author, Carol Gorman, did an amazing job with the story’s word choice, and she left leeway for your imagination to fill in the blanks of the story, instead of dealing you a cold hard description of the characters, and settings, that you may not like. This adds to the entertainment of the story because you can control how you visualize the setting, the characters, and the overall seriousness of the novel. For example, if you are feeling like a serious realistic novel one day, you can imagine and picture the story that way, or if you are feeling like a silly cartoonlike novel another day, you can picture it that way too. In conclusion Games is a fantastic novel because of its entertaining content that will make you sad to put the book down and because of its leeway for imagination. Mick Sullivan and Boot Quinn have been enemies since the day they first met. They have had countless fist fights and have already been suspended once in the first month of their eighth grade year. Mick Sullivan is big for his age which make people think he likes to fight way more than he does. Actually, Mick likes to read more than anything else. He considers the library his second home. Mick's father is constantly trying to get him to be tougher and get him involved in sports, but Mick just doe Mick Sullivan and Boot Quinn have been enemies since the day they first met. They have had countless fist fights and have already been suspended once in the first month of their eighth grade year. Mick Sullivan is big for his age which make people think he likes to fight way more than he does. Actually, Mick likes to read more than anything else. He considers the library his second home. Mick's father is constantly trying to get him to be tougher and get him involved in sports, but Mick just doesn't enjoy them. Boot doesn't have many friends. He likes to play the guitar and wants to someday be in a band. His biggest goal for the day is to give Mick a hard time by teasing him about his father who has a drinking problem. Both boys have difficult home lives that they really keep hidden from everyone else. They also like Tabitha Slater, the most popular girl in the eighth grade. Things start to change when a new principal comes to the school. After their latest fight, instead of suspending them again, he assigns the boys to come to the office to play games for an hour every day. This extra time together, without adult supervision, leads to some heated exchanges and ultimately some extremely devastating consequences for both Mick and Boot. While cooperation and civility don't happen in the traditional sense, they do start to learn about each other. Carol Gorman, the author of the Dork in Disguise series, takes us on the emotional rollercoaster of middle school where what your friends think is what drives the majority of your decisions and with most people there is more than meets the eye. Reading children type books as an "adult" is difficult. Not because the writing is terrible or the story and characters don't work. More so because I just can't relate any more. I read this with a boy I tutor or I probably would have never heard of it. I enjoyed reading it with him and was excited to see it spark interest and wonder in a boy who typically doesn't enjoy reading. It made him ask questions and allowed me to present questions about right/wrong, friendships, and hard family situations Reading children type books as an "adult" is difficult. Not because the writing is terrible or the story and characters don't work. More so because I just can't relate any more. I read this with a boy I tutor or I probably would have never heard of it. I enjoyed reading it with him and was excited to see it spark interest and wonder in a boy who typically doesn't enjoy reading. It made him ask questions and allowed me to present questions about right/wrong, friendships, and hard family situations. What I found difficult however was trying to control my disdain for many of the school children and also the main characters at certain times. Though by the end I did feel for them since both home lives were not ideal. I think it presents an understanding that bullies may be bullies because of home stuff out of their control. You never know what someone may be going through. The messages were great and I definitely wasn't expecting such a reality check with the ending (it got real- real fast). Overall I would suggest this for younger kids around the age of the boys in the book because I could tell the boy I was helping could relate very well. It took awhile for this story to take off for me, in part because I did not find the boys' personalities distinctive enough to remember whose voice was narrating a given chapter. Fans of books told in alternating perspectives (a la "Flipped") may enjoy this one. them again,the new principal It took awhile for this story to take off for me, in part because I did not find the boys' personalities distinctive enough to remember whose voice was narrating a given chapter. Fans of books told in alternating perspectives (a la "Flipped") may enjoy this one. Does putting "I like happy endings" count as a spoiler? I like happy endings. Even though they seem a little to mainstream, it just feels so good to end one of your page turning adventures with a smile. Games by Carol Gorman is a page turner. 'Nuff said! This book shows that...(1) Some people build a facade of power (2) You should look beyond that front (3) Because little do you know, they put up that veneer because of a v Does putting "I like happy endings" count as a spoiler? This book shows that...(1) Some people build a facade of power (2) You should look beyond that front (3) Because little do you know, they put up that veneer because of a very grave reason and lastly, (4- I call this the mother of all "lessons learned") Never ever EVER judge something or someone without getting to know it/them yet. The story of two guys who constantly find themselves in conflict with each other. The new principal decides to put them into a hour of assigned ISS each day together with the objective being that they play "games" to work on cooperation and getting to know each other. The story is told in turn by each boy. Of course, predictably, they initially hate the idea and are non-cooperative, but eventually they learn more about each other and gain insight and friendship. Two boys who can't stop provoking each other are forced by their new principal to play games with each other each day during an in-school suspension. The forced time together breaks down barriers between the boys and they become, if not friends, at least, no longer enemies. [return][return]Will have some appeal to boys and game players. Tension in the story is mild and could have been stronger to draw the reader in more toward the stories of the two boys and their very similar families. I really liked that my kids said "I'm really happy we're in a good family" while they were listening to this book. I also like the idea that people can't really be enemies once they are forced to get to know each other. There are a lot of lessons about peer pressure in this book, too. It's not really for younger kids, though. A cool book! About two bullies and they have been fighting against each other. The new principal has decided that they are going to play games until they can get along. The games include, Scrabble, Authors (A card Game), Connect Four, Checkers, ect. I thought that this book was for kids who like realistic fiction. I would recommend this book to everyone. This is a good story that gives you a different perspective on two bullies. These troubled boys have lots of issues and are basically enemies. They're forced to spend day after day together, playing games in a small space as punishment. . . or maybe rehab. I really enjoyed the story. Unfortunately, the cover is awful, and that makes it harder to convince my students to read it. Love the idea, and the switching first-person viewpoints is engaging. The acceptance that develops between the two boys is slow and therefore quite realistic. A decent read; may be read by boys who like Tangerine and similar "bad boy" tales. Easy to read. A good story about 2 boys who don't get along. They both see that their disagrements weren't worth losing things that were important to them. As a teacher, it makes you remember that students come from all kinds of families and backgrounds. This was another one of those books that felt to me like it was set in the 40's or 50's, but that I think was set in the present. The insults the boys slung at each other just seemed so . . . tame and odd. And their interactions with the dream-girl were also weird. I really liked this book about two students who are always fighting. They get on each other's nerves. The principal makes them come into a room off his office to play board games until they can call a "truce." They never really know it but they are a lot alike. Good book about not bullying. Two boys who always bully and fight with each other are made to play games together every day for a week in an attempt to get along. Every other chapter is told from a different character's point of view. Good characters--I was satisfied with the conclusion. Heavy, realistic. Told in alternating chapters by the boys who are forced to play Games. Dysfunctional families. Carol Gorman is an Iowa-born writer of over 40 published books. She spent 17 years teaching in middle-school, high-school, and college classes. Her writing time has been devoted to creating mystery and suspense novels for children. She originally aspired to be an actress, and while studying at the University of Iowa, was cast in the lead of both West Side Story and Peter Pan. In the 1980s, Carol m Carol Gorman is an Iowa-born writer of over 40 published books. She spent 17 years teaching in middle-school, high-school, and college classes. Her writing time has been devoted to creating mystery and suspense novels for children.